Our Experts will unleash the full potential of your projects! 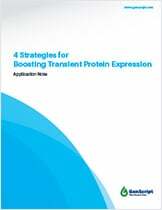 An application note with strategies on how to improve transient protein expression. 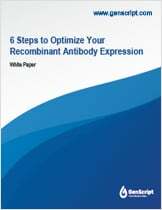 A white paper with technical advice on how to optimize your system for rAb expression. Our goal at GenScript is to accelerate research by being a reliable partner for your discovery efforts and we hope to work with you as you explore new frontiers in science. Experimental, therapeutic and commercial applications require the production of high quality recombinant proteins and rAbs at a certain scale. However, generating the desired quality and amount of recombinant proteins and rAbs can be a challenging task. GenScript's custom recombinant protein and rAb services provide a comprehensive portfolio of recombinant protein expression systems, that include bacteria, yeast, baculovirus infected insect cells, and mammalian cells. With our proprietary OptimumGene™ Codon Optimization Technology, the expression level of target recombinant proteins can be significantly increased in most systems and especially in E. coli. In addition, we offer a full spectrum of recombinant protein and rAb purification methods to achieve the ideal level of recombinant protein and rAb purity for all your downstream applications. With customized solutions, flexible production scale, and proprietary technologies, we work in partnership with our clients to ensure efficient and high quality recombinant protein and rAb production, process development and scale-up production of biologics for research purposes. GenScript has delivered over 5,000 batches of recombinant proteins used for functional assays, high throughput screens, antigen generation, structural analysis, and many other drug discovery applications. When our extensive expertise in recombinant proteins and rAbs is integrated with our in-house gene synthesis and assay development capabilities, we can quickly deliver your projects in a flexible and cost-effective manner. Moreover, our dedicated technical account managers will guide your project through every step of the process, and constantly keep you informed of project progress. MamPilot™ Guaranteed Pilot Expression New!